I've been waiting for over 6 months to get my hands on Nosler's new AccuBond Long Range bullet for my .270 Win. They have a unprecedented BC of 0.625, right up there with the 7mm bullets. As you can see it is very long and slender, 1.430". The nose is so long I can not reach the lands when I load it at max magazine length of 3.360" - COAL for the lands is 3.509". I'm also going to switch from my IMR4350 powder and try AA MagPro. Its a double-based powder designed for Magnum cases but works in the .270 Win with heavy bullets. I should be able to get velocities close to 2900 fps mv. Minimum opening velocity is 1300 fps. I'll have to figure out how to test that. looks great. with that super long boat tail it will be a breeze to pop her in the case for saeting, hopefully it expands well for you, look forward to seeing your results. I wonder how the standard rifling twist will handle stabilising the bullet. I bought some 150gr Barnes' TTSX back in May but didn't get to test them before heading back here. On the box (though NOT on Cabela's website) is the caveat that they may not stabilise with a twist of less than 1:9. I know 150gr SGK's are OK.
150gr Barnes' TTSX back in May but didn't get to test them before heading back here. On the box (though NOT on Cabela's website) is the caveat that they may not stabilise with a twist of less than 1:9. .... I know 150gr SGK's are OK. 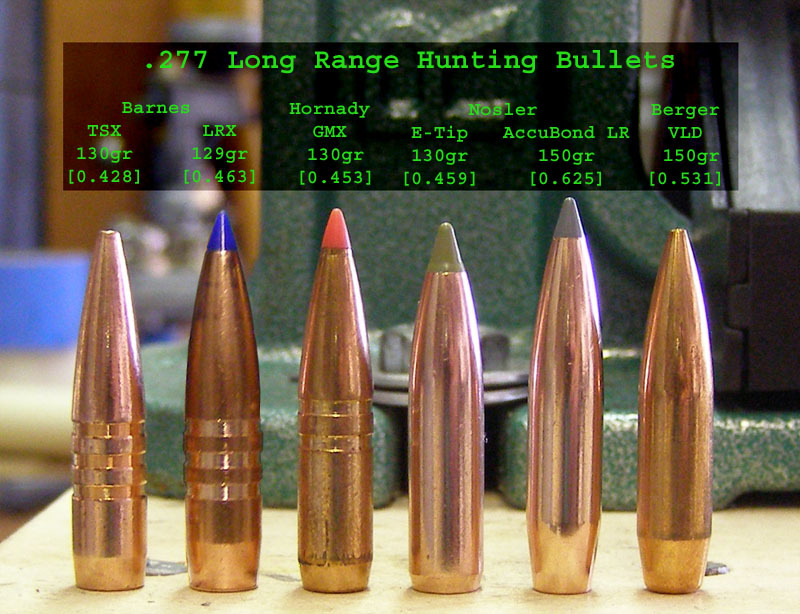 Typically a 130gr all-copper bullet like Barnes is the same length as a lead-core 150gr bullet. If you can measure the length of your 150 TTSXs we can see how marginal their stability is with a 1:10 twist. that compensates for plastic ballistic tips, the stability factor is 1.3. I'll see how they do when I shoot them. BTW, the JBM bullet length database lists only the 150 TSX not the TTSX. That's not a bad looking bullet Slim...be interested to see how they perform. Although the bullet is verrrry long, the actual bearing surface doesn't seem any different to the other bullets, and as Elvis noted...a verrry long boattail section. Yeap, the bearing surface appears less than the others which will reduce internal friction and potentially allow me to achieve a respectable velocity. It will be a couple of weeks before I can get to the range, however. Just excited to get them. They are already loaded up. You'll have to wait until November for my report on the TTSX, as I fly out on the 7th. English Mike, glad you are getting back State Side. if you have 10 or so that are left over that you don't want to load fire, send them to me and I will run them through my bullet performance test. Will do - remind me at the beginning of November, as I might forget. I made it to the range today to start load development with the 150gr Nosler AccuBond Long Range. I was trying MagPro powder with an OCW ladder from 59.5 (2825 fps) to 61.5* grains (2920 fps) using Federal Match primers shot from my Tikka T3 Lite. Most accurate* was 61.5 which is listed as max on the Nosler website and I started getting a slight crater on the firing pin impact so that looks like the limit in my gun. I had loaded up an extra one at 59.5gr and shot it into the bullet trap at 100 yards to get an initial look. Below is a picture of the results including a comparison of the 100/110gr AccuBond at 100 yards. I was very surprised when I pulled a very small mushroom from the trap. The bullet only measured 0.332" long (down from 1.430"), expansion was 0.453", weight retention was 37%, and penetration was only through 1400 pages of the phonebook. Of all the bullets I have tested in my .270 Win, this bullet's expansion is the smallest, its retained weight the lowest, and its penetration the shallowest. There was evidence of significant fragmentation (picture below). I have never seen fragmentation like this show up on the corrugated plastic which sits right behind the water jug. 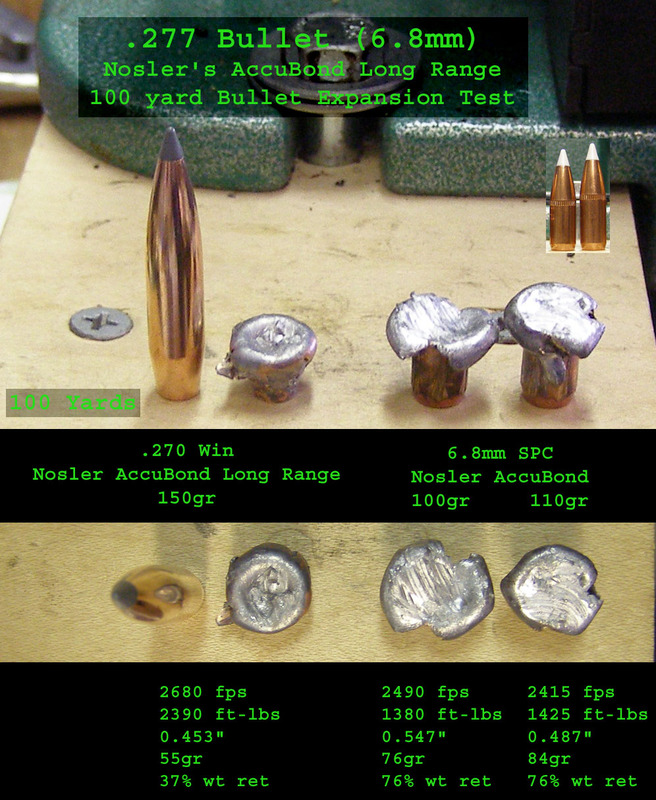 Not even with the 120gr SST which fragments more than any other bullet I've tested. The Nosler website lists these bullets as hunting bullets for "Deer, Moose, African Game". I know the regular AccuBonds have a proven reputation for these game animals. However, this initial test at 100 yards indicates that the AB LR does not have similar performance to the Nosler AB bullets and will not be as effective as other premium .277 bullets on deer, elk, or hogs which are the game I hunt. It looks like the lead core is softer lead than used on the 100/110gr .277 AccuBonds I use in my 6.8 (the 100/110 lead is more silver and shiny). I would even have concerns about this bullet's ability to penetrate bone. I would not use this bullet on elk or hogs. I might use it on a broadside deer shot but would be concerned about lead fragmentation throughout the meat. I would not expect an exit wound on the far side at this range. Other calibers in the AB LR may perform better due to differences in copper jack thickness or composition of the lead core. Interesting, the regular Nosler AB's are good performers and have never tried any of the long range varieties yet. 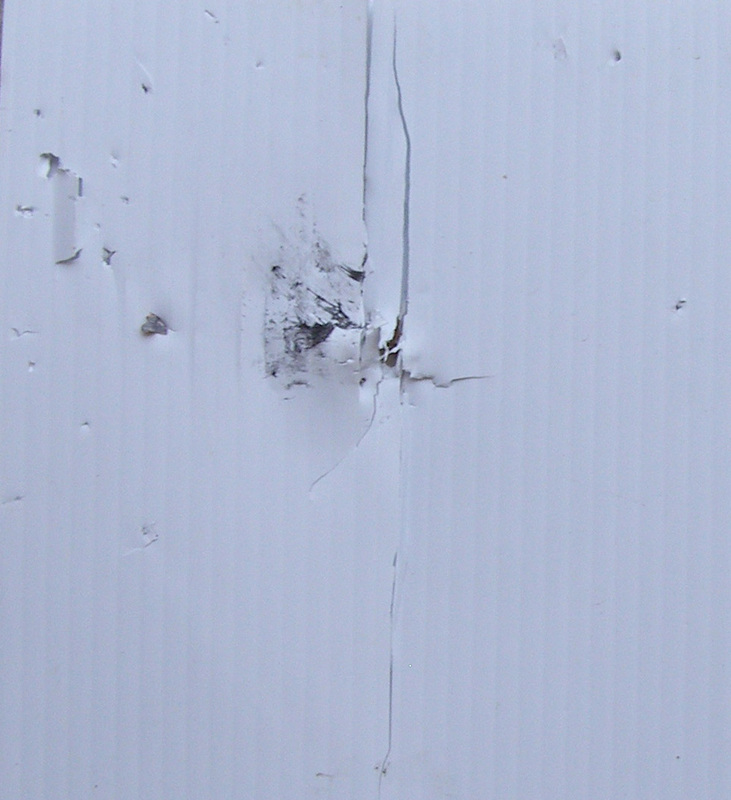 Have used corrugated cardboard for years testing bullets and never seen an accubond like in your pic. Maybe this is something for Nosler to be aware of. I have already heard back from Zach Waterman, Nosler's Public Relations Manager. "Your feedback is consistent with the nature of what the AccuBond Long Range bullet was designed for. For many years, long range hunters have been requesting a bullet that reliably expands at yardages up to and even past 1200 yards but will still hold together without “blowing up” at closer yardages. Of course, it is extremely difficult to build a bullet that expands the same at every impact velocity but we feel the AccuBond LR is the best there is for this long range application. With its high B.C. and soft nose, the ABLR really starts to shine past 400 yards both in external and terminal ballistics, hence the “Long Range” designation." I appreciated Zach's quick response. However, I think Nosler should have built this AB LR like the 100gr AccuBond. I will continue to test this bullet at longer ranges but I can't afford to sacrifice performance inside 400 yards just to get have good performance beyond 400 yards. If anyone has a six8 with a 1:10 twist or faster and can fit this bullet in their magazine, this might be a great combination. I guess the answer is to carry both types with you when hunting & load appropriately. I'd be minded to have standard Accubonds in the magazine & some LR's carried if a 300yd plus shot was needed. Or I could stick with GameKings & not worry too much about what are after all mostly minor differences in performance when compared to ensuring accurate shot placement.